Insight Development is the producer of this innovative software and I'm not surprised at the high quality of it. That's because I reviewed their first product, Hot Off The Web in a previous issue of Link-UP. . .and I thought *that* was innovative. Zip Up The Web has got to be one of the easiest pieces of software I have ever installed or used. Seriously. I popped the CD in, it took seconds to install, took me to the web site to get the latest update, then when I started it, all I needed to know or do was right in front of me. No pull-down menus, no other windows to look at or fiddle with (unless you want to change the User Preferences, of which there are few to change), everything is there easy as can be. I did decide to use the "Watermark" option, which allows you to add your own comment line or signature to the end of the zipped page(s). I could even link my watermark to my own home page if I wanted (great for reminding customers about your business). 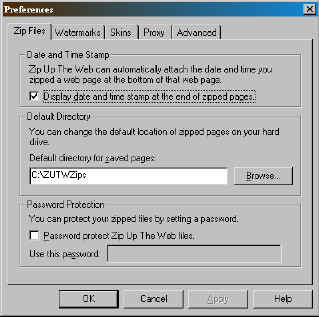 I opened both MS Internet Explorer and Netscape Communicator to try out Zip Up The Web (or ZUTW as it is fondly called by users). I went straight to the ZUTW home page, decided where to put my stored ZUTW pages, clicked on the ATTACH TO EMAIL and clicked on the ZIP button. Seconds later, it was zipped up and my e-mail program popped up, ready for me to send the zipped page to anyone I wanted. I sent it to myself, then clicked on "check mail" in my e-mail program. The messages immediately began to download - they did take a while, maybe all of two minutes, so while I waiting, I played around with the ZUTW program itself. It has this nifty thing called "skins." You can change the default look of the program (bright blue and green) to one of two skins included with the program (Old Radio or Watch Works) or go to the ZUTW site and download more skins to choose from. They're even holding a contest for new skins. I had some fun with this and tried out the Watch Works and Space skins. My download was complete by this time. Subject: From Zip Up The Web Pro! I clicked on the zutw1.exe (for MSIE) and up it came in the MSIE browser window. I did the same with the Navigator message (zutw2.exe) and up it came in the Navigator browser window. Everything I'd seen on the ZUTW home page was there - all the graphics, all the text, all the links. Since I was online, the links worked perfectly. And this took me all of a few seconds to "ZIP," then e-mail. In addition to e-mailing or saving (or zipping) one web page, you can also designate to save up to six layers of pages at a site, but remember that this may take a while to e-mail to someone if that's what you intend to do. It may be preferable to send them the main web page, then use Hot Off The Web to add "post-it notes" so that they go to the places you want them to. You can also Password Protect the Zipped files and/or add a Date and Time Stamp so that you know exactly when and where you found the page(s) you Zipped. It's just as easy to get the page or site you want to Zip Up - just type it in the space where it reads "Enter URL You Want To Zip." Yes, it's that simple. Everything about it is. 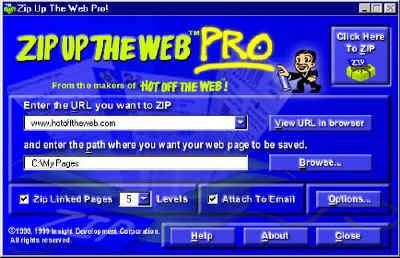 "Zip Up The Web Pro was created for the express purpose of making it easier to gather information from the web. It is an application that we hope you will find both fun and useful. However, please keep in mind that the web pages you grab using ZUTWP are still under copyright protection of the original designers. You may not distribute any captured pages without the explicit permission of the copyright owner except for the purposes of research and information sharing. For a complete discussion on copyright law, visit the U.S. Copyright Office's website. Insight Development Corporation does not warrant, guarantee, or make any representations regarding the use or the results of use of the software in terms of correctness, accuracy, reliability, or otherwise. Insight Development Corporation shall not be held liable for any direct, indirect, consequential, or incidental damages arising out of the use of or inability to use this software." There are no downs to this software - just up, up, ups! I highly recommend it to anyone to use - kids can use it for school, business people for work and families for sending their favorite sites back and forth. It's a neat little program that packs a lot of power, all for just $29.95 (retail) from their site (or try ZUTW Lite for free). And it even comes with a 30-day money back guarantee.